Rupert Read would like you to see 2019 Extinction Rebellion - Choose life & rebel with us. Rising Up Extinction Rebellion hasn't added a story. Life on Earth is dying. We believe it is our duty to act. Together, let's unite and insist our governments take action for us, our children and all life! Governments must tell the truth by declaring a climate and ecological emergency, working with other institutions to communicate the urgency for change. Governments must act now to halt biodiversity loss and reduce greenhouse gas emissions to net zero by 2025. Governments must create and be led by the decisions of a Citizens’ Assembly on climate and ecological justice. We've scaled up & organised in communities across the world, with over 300 XR chapters in 40+ countries. Everyone is vital to our chances of success and making a donation is one very useful way to participate. We are up against the conglomerate fossil fuel giants with multi-millions to their names, ready to squash mass societal change that threatens their profits. Love and rage in the face of extinction. 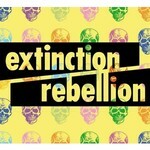 Rising Up Extinction Rebellion hasn't posted any updates yet.